Perhaps no film this year, released or upcoming, is going so viral as Shah Rukh Khan and Anushka Sharma starrer 'Jab Harry Met Sejal'. Directed by Imtiaz Ali, the film is scheduled to release on August 04. There is something intriguing about the new concept of mini trails introduced by 'Jab Harry Met Sejal' to the Indian cinema. They leave with you a mystery at the end and hence you become desperate for the next trail to release. That’s what has just happened with the mini trail 3 of 'Jab Harry Met Sejal'. After the first two mini trails, we are sure that Shah Rukh aka Harry will have no issues if he gets physically intimate with Anushka Sharma aka Sejal, thanks to Anushka’s indemnity bond. 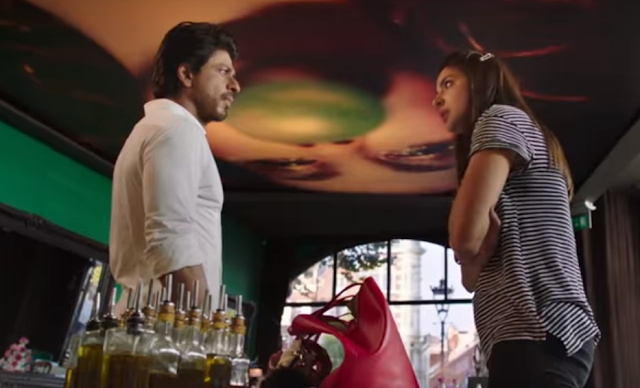 We are also sure that Sejal is a Gujarati girl who has studied LLB. With the third mini trail it is now evident that Harry is a Punjabi munda. In the 'Jab Harry Met Sejal' mini trail 3, Shah Rukh Khan and Anushka Sharma are seen fighting for a ring. Now we are left with the mystery of this ring. What could it be? We all know that director Imtiaz Ali had kept ‘The Ring’ as the film’s working title. So it is but evident that this ring will surely play an important role in the film. Titled 'Excuse Hai', Anushka Sharma and Shah Rukh Khan, in this mini trail are apparebtly going somewhere and Anushka says- "Hum ring liye bina nhi ja skte (We can't go without the ring)"
The best part of the three trails released so far is the effortless chemistry of Shah Rukh and Anushka. The comfort that they have shared with each other is so evident in the trails. It is be to noted that 'Jab Harry Met Sejal' would be their third film together after 'Rab Ne Bana Di Jodi' and 'Jab Tk Hai Jaan'. With the ring’s mystery fans would now be waiting for the mini trail 4 which will be released tomorrow. Keep checking this space for the mini trail 4.